Currently a Summer Resident at the Archie Bray Foundation in Helena Montana, Jeff Campana is the Visiting Artist and a Lecturer at the University of Louisville. He received his B.F.A from the University of Wisconsin, Whitewater in 2004 and his M.F.A. from Indiana University in 2008. 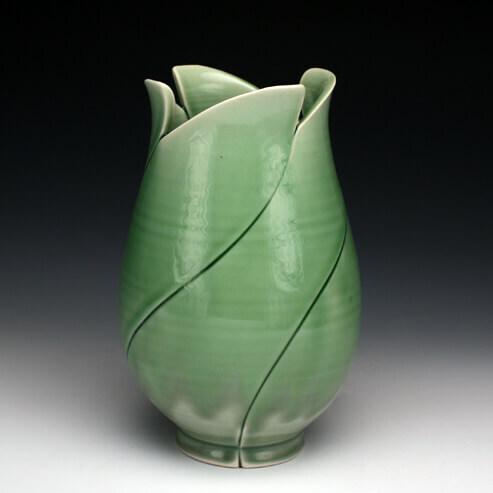 In recent months, Jeff’s work has been featured in Ceramics Monthly and Pottery Making Illustrated magazines. He continues to develop as he shows his work in group and solo exhibitions nation-wide. I draw lines by dissecting and immediately reassembling each pot. The result is a surface decoration with structural implications. The fault lines that decorate the surface threaten to but do not actually undermine the vessel’s ability to display, contain, or deliver. I see utility and the requirements it poses on form, heft, balance, and proportion as the subject of my work–an endless source of ingenuity. Decoration is intuitively developed to enhance or reinterpret the form to which it is applied. While crafting these objects, I am careful to preserve the subtle marks of process, as each piece tells the story of its own making.